Download the app using the buttons above from your mobile device or search "ASHRAE 365" on the App Store or Google Play. 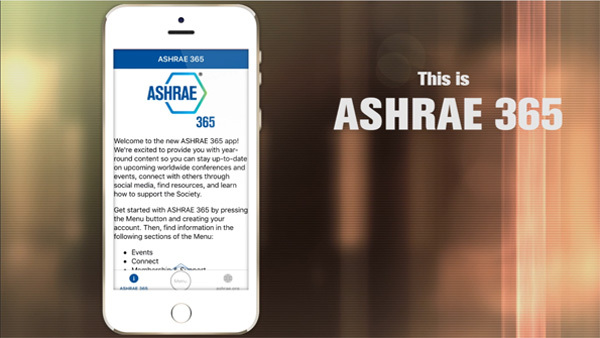 Welcome to ASHRAE 365 – a new app providing year-round updates on all things ASHRAE. 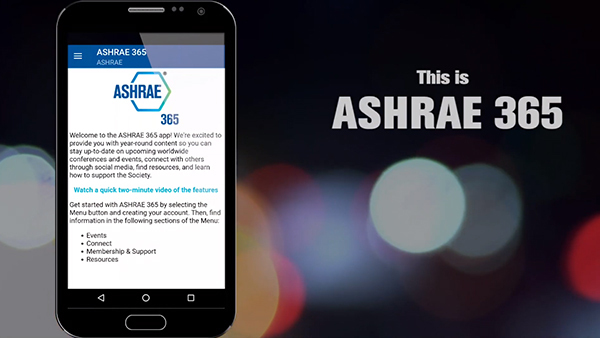 This 2-minute video provides a quick overview of what ASHRAE 365 has to offer including information about events and the ability to connect with other members, find resources, and support ASHRAE. Events section where you can find information on ASHRAE Conferences, Chapters Regional Conferences, Topical Conferences, Events Calendars, and Virtual Conferences. Connect section providing notifications pertinent to the Society and quick access to all of ASHRAE’s social media platforms. Resources section with access to ASHRAE volunteer resources, Standards and Guidelines information, continuing education courses through eLearning on Demand as well as search features for industry jobs and materials to help you engage others with ASHRAE. Membership & Support section offering leadership information, ASHRAE chapter details, information on how to support the Society through donations or volunteering, and how to get in touch. Social Profiles – Create a profile to locate and message other attendees, post to the event timeline, and sync your itinerary between devices. Event Dashboard – See your schedule, reminders, event updates, latest conversations, newest timeline posts, and most popular sessions. Activity Timeline – View and swap ideas, photos and lessons learned with other attendees. Leaderboard – Post about sessions and get likes for your posts from other attendees. Notifications – Be in the know with important announcements and push notifications. Schedule – Search sessions and speakers, create your own itinerary, download handouts, take notes, and make appointments. Session Evaluation Surveys – Provide feedback about individual speakers and technical content. Notebook – Take session notes and export to share or reference later. Maps – View venue floor plans.